When we ask you to think of your favorite musical duo, your mind probably goes to Idina Menzel and Kristen Chenoweth, or Nathan Lane and Matthew Broderick. 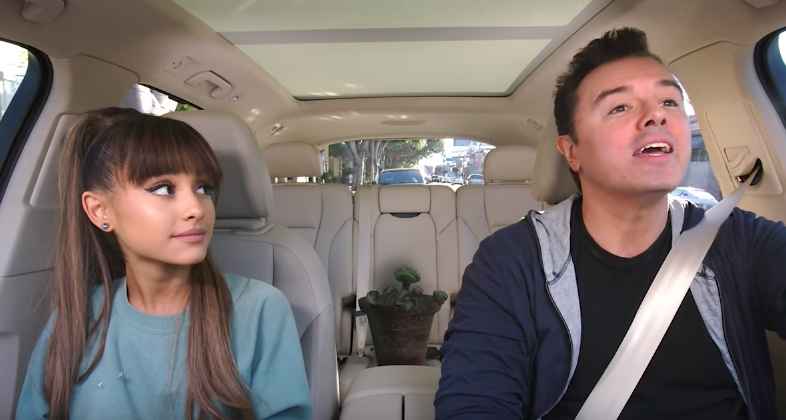 But after watching this Carpool Karaoke preview, your new favorite musical duo is Ariana Grande and Seth MacFarlane. Grande and MacFarlane joined forces to sing “Suddenly Seymour” from the classic off-Broadway show, Little Shop of Horrors. They did so for Apple Music’s newly claimed Carpool Karaoke: The Series — and this is just a preview for an entire episode. We’re dying to the see the rest! But to be honest, we’re more interested in seeing an entire Little Shop show with Grande and MacFarlane at the helm. Like in any good theater performance, there was a bit of a hiccup during the build to the end of the song. MacFarlane briefly slammed on the brakes and threw a cuss into the lyrics. But as anyone involved in the theater knows, the show must go on! "We almost died! But the belting was more important!" Grande said when the song ended. "I like that we didn’t skip a beat. That is what comes from being a theater person. You stay in it!" Late Late Show host James Corden announced earlier in the year that he would be passing his Carpool Karaoke idea along to Apple Music and letting the stars drive and sing their hearts out on their own. It has been almost a year since Grande and MacFarlane filmed their segment, and although we were nervous about Corden giving up the driver’s seat for the Apple Music spinoff, Grande and MacFarlane proved that this new endeavor will be amazing. Now please someone cast these two in a Little Shop revival? We need it!